InfoComm International will host its IoT Insights New York conference on September 8, 2016, at the Renaissance New York Times Square, to explore the role of the Internet of Things in professional AV solutions. 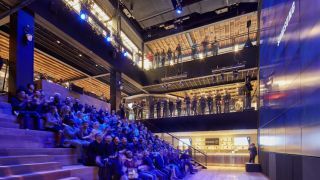 Organizers announced that the event will conclude with a tour and reception at the brand-new technology experience center Samsung 837, in the heart of Manhattan's Meatpacking District. Registration is now open at infocomm.org/IoTinsights. "The Internet of Things is more than a catch phrase; it's an opportunity for AV systems integrators to grow their businesses by expanding their role in machine-to-human communications," said Betsy Jaffe, senior vice president, member services, InfoComm International. "In addition to getting a chance to meet some of the leading industry experts, IoT Insights attendees will be able to participate in a grand tour of Samsung 837, an experience center that is a prime example of innovative customer environments. Through creative use of content, space, and technology, Samsung 837 is a showcase of exceptional AV experiences." InfoComm International launched its IoT Insights event series earlier in 2016 with conferences in Santa Clara, CA and Las Vegas. This conference is designed to put IoT in context for AV professionals, focusing on the potential opportunities in this burgeoning technology field. Gary Hall, CTS-D, CTS-I, chief technology officer, Federal Defense, at Cisco Systems, will begin the day with a keynote address on how digitization and IoT have changed how the world works, leading to endless prospects for AV professionals. Conference sessions throughout the day will showcase real-world IoT applications, as well as in-depth discussions of critical IoT-related issues, including security and data analysis. Attendees will then hop onto THE RIDE, a multi-million-dollar motor coach, for an AV tour of Times Square. THE RIDE features floor-to-ceiling windows, stadium-style seating, 40 LCD displays, 3,000 LED lights, and surround sound. Attendees will be dropped off at Samsung 837, the company's flagship experience center. Samsung 837 is a technology playground and cultural destination for consumers, creators, tech enthusiasts, and community members. Attendees will enjoy Samsung 837's virtual reality tunnel, amphitheater, interactive art installations, three-story digital screen, broadcast studio, and private areas closed off to the public. Designed by WonderWall Inc., the space is home to live music performances, exclusive screenings, and radio recordings. The building is a creative expression of Samsung's brand and serves as home for the marketing center of excellence, executive briefing center, and new customer care center.